Daughters are earning nearly three times what their mothers did, helping lift some families up the economic ladder. But they still earn less than their dads did and far less than their brothers, according to a recent report by the Pew Economic Mobility Project. So men's wages remain more important when it comes to increasing couples' family income and their upward mobility. Pew compared the hourly wages of mothers who were around age 40 in the late 1960s and early 1970s and their daughters, who were about the same age in the 2000s. What a difference a generation makes. Researchers found that many more women hold down jobs these days, and they work longer hours and command higher wages than their mothers. 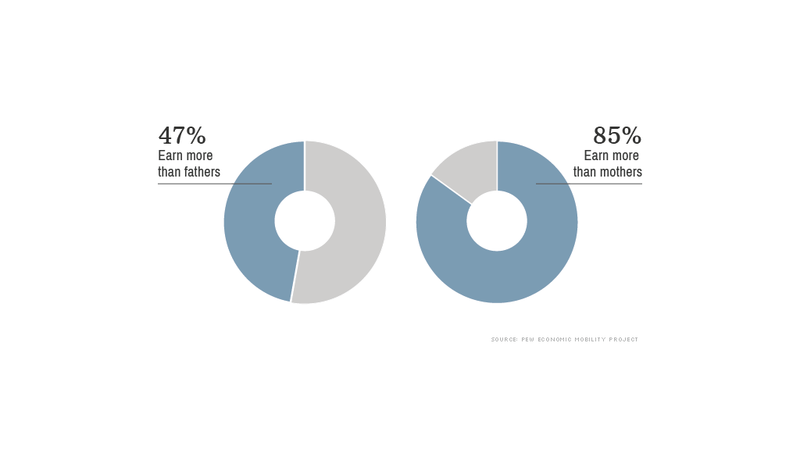 Daughters now contribute nearly half of a family's income, on average. Their mothers' earnings were only one-fourth of her family's income. One reason women today are a more integral part of their families' finances and economic mobility is because more of them are in the job market. 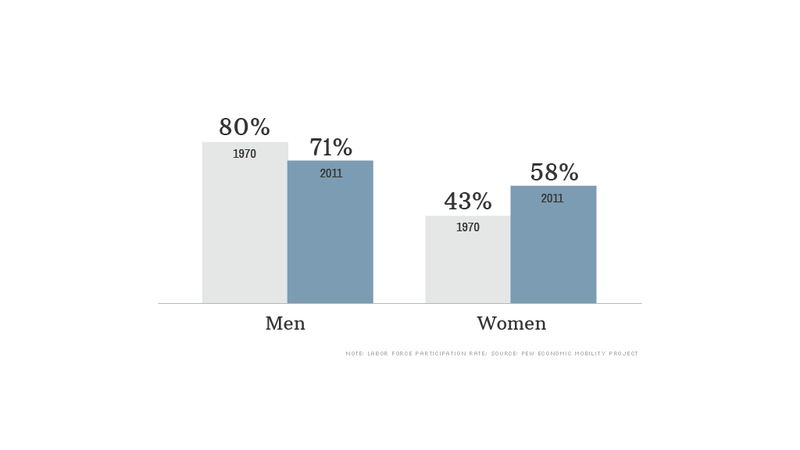 Four times more women work full-time than a generation ago. Men's participation in the labor force has been slipping for decades, but they were hit particularly hard by the Great Recession. This further boosted the importance of women's earnings in recent years. 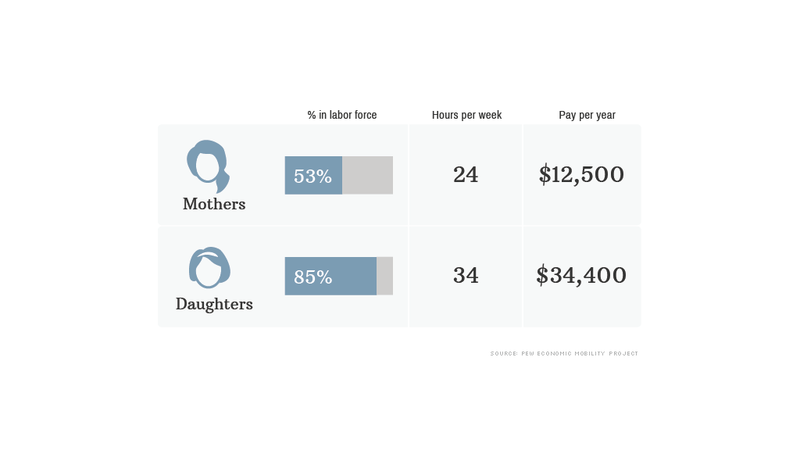 Daughters' median hourly earnings are at least 50% more than their mothers at every income level. The fact that they are working longer hours has help boost mobility, particularly for those at the bottom and middle of the economic ladder, the report found. Still, their brothers' wages remain higher than every other member of the family. 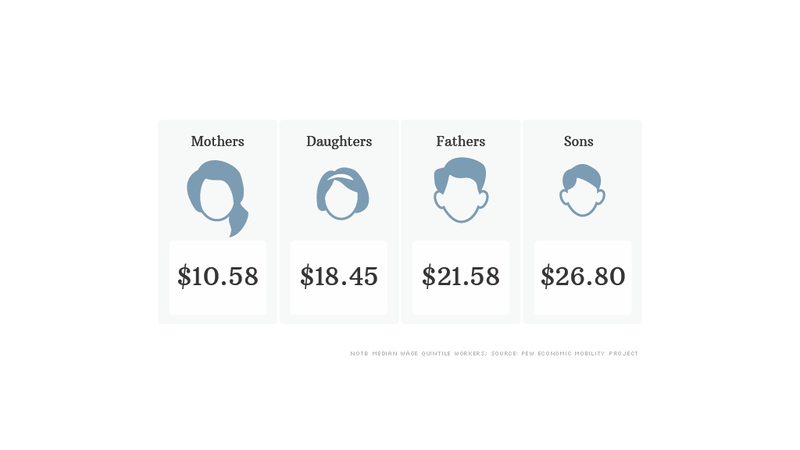 However, the wage boost between fathers and sons is smaller than between mothers and daughters. But despite their advances, daughters at each income level still earn less each hour than their fathers did 30 years ago. Part of the reason for the gap are that women often temporarily leave the workforce to have children. Also, they are more likely to work part-time or hold a job in a low-wage industry. Looking ahead, Pew researchers expect women to be an even more important part of their families' financial security and economic mobility. Women are graduating from college at higher rates than men, and the wages of the youngest women workers are more comparable to their male peers than ever before.